Quality: a choice, a commitment! At Preverco, people and technology go hand in hand. At our cutting-edge plant, employees feel a responsibility to do their best. 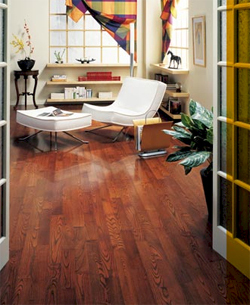 Step by step, we produce flooring of the highest quality. Everyday we work to help you realize your dreams. Everyday, customers like you put their trust in our products. Preverco goes beyond quality. Sigma: The sum of all our advanced technologies! With these state-of-the-art technologies, Preverco controls every step of the manufacturing process from wood selection to finishing. They all add up to create the highest quality product as well as the hardest and smoothest finish in the industry. Our grading system separates wood into different categories based on color intensity and other characteristics. Contrary to popular belief, grades do not represent various levels of quality but rather reflect the criteria chosen to classify wood. Whatever grade you choose, with Preverco you know you are getting the highest standard of quality.